Synopsis: “After his recovery & realization of his mistakes, Ken returns to Tekong Island to continue his Basic Military Training (BMT). Determined to change, Ken prepares to prove himself. However, this change in attitude from Ken, immediately draws the dislike and mockery from some his Section mates led by Lobang. In such an environment of mutual distrust and sabotage, will they be able to shake hands and work together, to face their greatest challenge?” (GSC Movies). Verdict: Perhaps not as tight as the first film but it’s amusing enough to sit through. Besides the problems with the story (see spoiler section below), it’s also not as realistic as its predecessor and there are unnecessary scenes with embarrassing CG “action”. Which is why it begs the question whether this sequel is to sincerely extend its message to the audience (which could’ve been done in the first film actually) and to hopefully influence them to do better, or to just plainly entertain and squeeze more profit out of the single production. 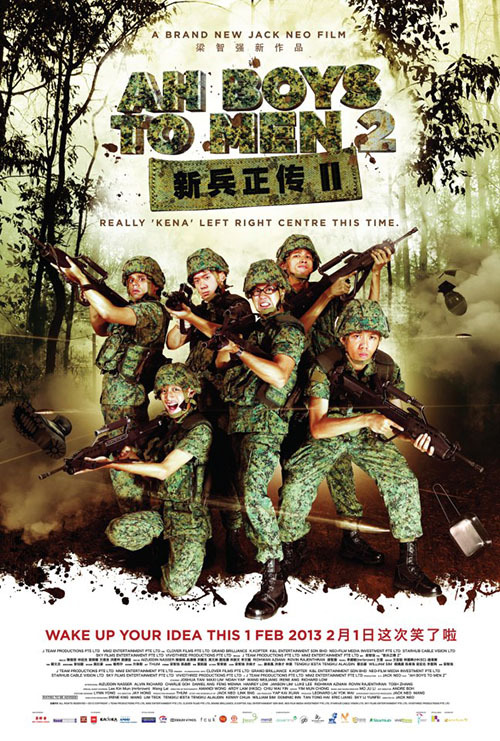 Anyhow, Ah Boys to Men 2 is a decent comedy which Singaporeans and Malaysians can relate to better, especially those who went for NS (National Service). The actors’ performance is just brilliant. Second opinion: “Very interesting and funny; can easily relate to the movie” (Iris Loong, who went for NS in Malaysia). Malaysian censorship: At least two to three scenes are obviously cut. One of them is clearly due to kissing in the bath tub, whereas for the others, I’m not so sure why. It definitely spoiled the fun a bit. Missing scenes? Some scenes that can be seen in the trailer do not appear in the final cut of the film. Not sure if they were deliberately removed in post-production or just chopped off by censorship. 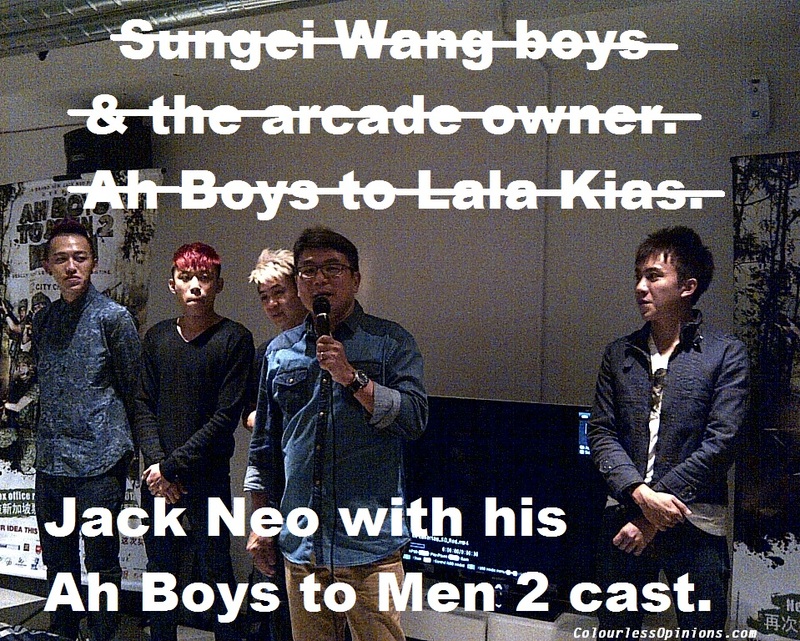 Second sequel confirmed: After apparently being requested non-stop by fans, Jack Neo agreed to produce a third film. All I’ll say about this is – redundant. Problems with the story: Ken’s deliberate heat stroke caused his father to become partially paralysed and because of that, he turns over a new leaf and begins to take his NS training seriously. However, he does not confess his foolish act to anyone at all, not even his NS mates, which if he did, Lobang and rest would’ve been more understanding. The sequel also tries to emphasise the good of NS but the fact is, in the story, the main reason why Ken turns over a new leaf is due to guilt, and not so much because of NS itself. The movie also does not seem to be very racially or genderly equal as well: both the non-Chinese actors play characters that are minor and not very bright; and all females in the film are stereotyped, including mothers. Speaking of which, the biggest problem of all, to me, is that Ken’s annoying mother doesn’t die or at least become more considerate at the end. Special thanks to Nuffnang & MM2 Entertainment for the invitation to the gala premiere & laser tag game. The only one I watch from him is I Not Stupid and Money No Enough. That's it. I doubt I'll watch this unless someone shove it in my face and force me to..